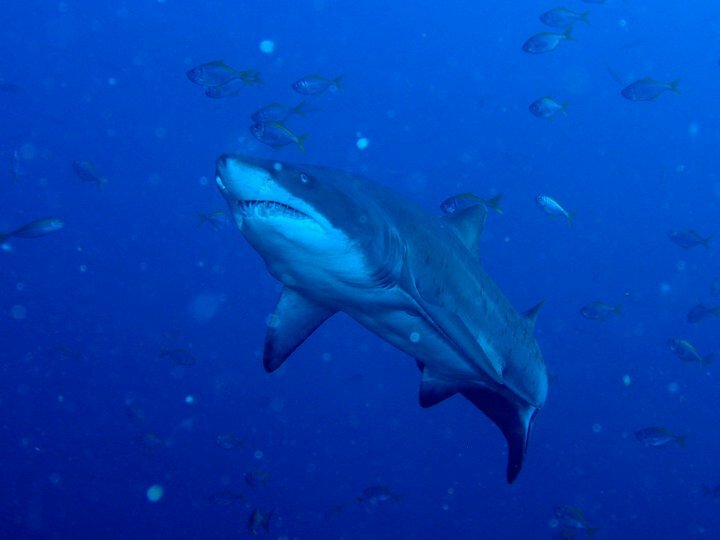 Undoubtedly, Forster is famous for its Shark Diving (Grey Nurse Sharks); best between approximately February and May, however, the sharks are present all year and Forster has many outstanding dives. The Pinnacle The Pinnacle is rated in the top ten dive sites in the World. 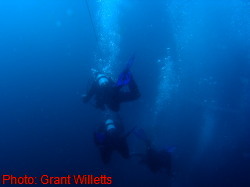 The Pinnacle is an advanced dive, depth 24 to 33m (and deeper). Roberto Rinaldi, a well-known Italian underwater photojournalist gave this top ten rating. Roberto spent ten years with Jacques Cousteau on-board the "Calypso" as the vessel's resident underwater photographer. This is the site that many divers experience their best dive ever, anywhere in the world. 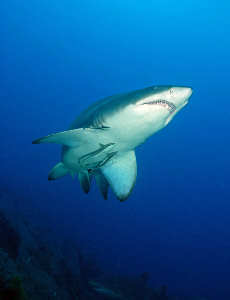 Grey Nurse Sharks up to 4m long in aggregations of 50 and more. Big kingfish, jewfish, trevally and stingrays are all seen here. When the "Pinnacle" is at its best there is no better dive in the world. This is the only place where you are liable to see big fish being eaten by big sharks. Located in the middle of the ocean, many other types of marine life is also seen here, such as blue and black marlin, bronze whaler sharks, seals, manta rays, white pointer sharks, cobia, Spanish mackerel and tuna. On rare occasions seen you could be lucky enough to see pilot whales, humpback whales, fairy penguins, mako sharks and at one time, a very impressive, 5m long great hammerhead shark. During the summer to early winter months, hundreds of jewfish (mulloway) "whirlpool" around the site. This whirlpool usually contains ten to twenty kilo jewfish. Around the outside of the whirlpool even bigger yellowtail kingfish circle the school. These kingfish act like sheep dogs, bumping into and pushing the jewfish around and ensuring that individual jewfish do not stray from the school. Around the outside of the school, two or three grey nurse sharks will swim in the same circular pattern, snapping up any unwary individual who ventures too close. Underneath the school, resident giant black rays swoop in to clean up the scraps. 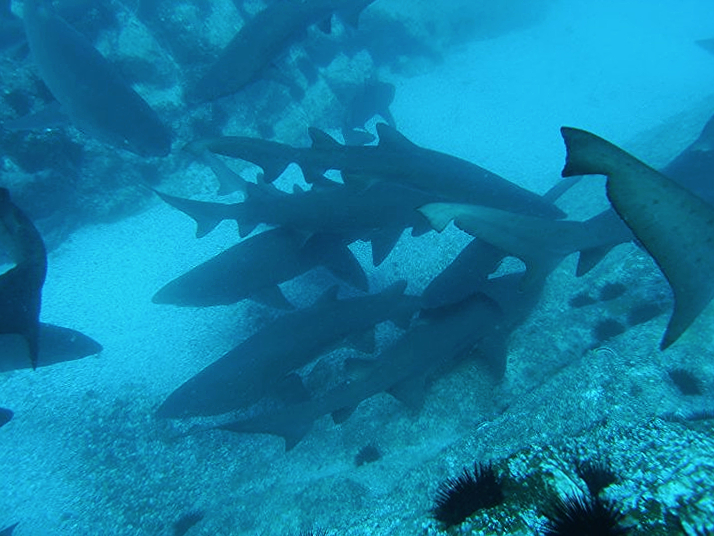 The grey nurse sharks cooperatively feed on the jewfish, the two or three attendant sharks sink back down to ocean floor after a few minutes of swimming with the school, to be replaced by the next sharks in line. Maximum depth, 20 metres. Open Water Level. Diamond reef is a 25-minuet boat ride north of Forster. This site is a macro photographers and divers paradise with an amazing variety of soft and hard corals, sponges and 38 different varieties of Nudibranchs, some of which are endemic to this particular reef. With an average depth of 16 metres, you have plenty of bottom time to explore and count the different types of Nudibranchs. The colours you will see on this dive will blow you away, from bright yellows to deep purples and everything in between. This site has many types of Invertebrates including Coral Banded Shrimps, Red Lined Shrimps to large Slipper Crays and Eastern Rock Crays. The fish life you will usually see here is generally quite small but on the odd occasion you may see Grey Nurse Sharks, small Whaler Sharks and even Marlin. It’s the Nudibranchs and corals that this dive is famous for. The shapes, sizes and colours of the Nudibranchs is amazing, from bright yellow with white spots, to dark blue with orange spots, you can do a full dive and see up to 10 different types in an area of only 3 or 4 square metres. The bottom composition is quite flat with shallow sandy gutters, with the highest points only rising 2 or 3 metres off the bottom. This site is quite fragile with all the soft and hard corals covering the entire bottom so good buoyancy control is essential to avoid undue damage to this reef. Depth 9 to 21m, Open Water level. 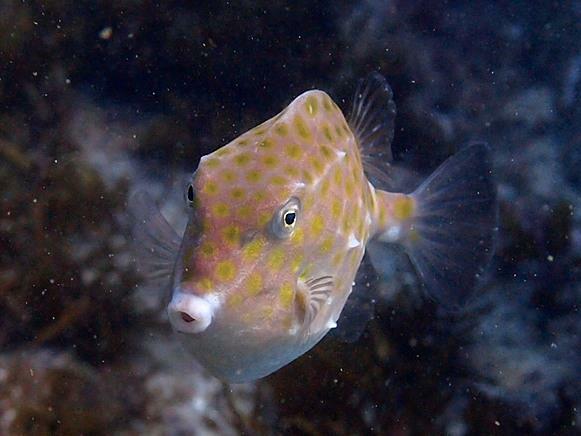 Spot A is one of the most popular dive sites at Forster, it is situated below Cape Hawk headland and is an easy 10 minute boat ride from the dive shop. The reef is the easternmost finger of rock extending from Latitude Rock and is some 400m in length. This dive is basically a wall dive with the top of the reef in 9m of water dropping down on the northern side to 19 m, (21m on the sand). The southern side gently slopes down to 17 m and is covered in kelp. Many varieties of kelp fish and wrasses live in this area. The eastern end of the reef slopes down to a depth of 21 m and this is where Spot A finishes. This area is very colourful and is known as the sponge gardens and is home to an amazing amount of soft corals and sponges, nudibranchs and a host of tiny little critters hiding amongst the sponges. The western end of the reef is the closest to Latitude Rock and is similar in topography with the main reef breaking into gutters and shallower bommies. The depth here is from 10 m to 18 m and is where you can often see Grey Nurse Sharks, large Cray fish, schools of bait fish and Eagle Rays. The northern wall about halfway along the rock is where the boat is usually moored at a spot called the Amphitheatre. Here the wall is at its steepest and the biggest concentration of fish life occurs, you will see everything here from Grey Nurse Sharks, huge Wobbegongs, Port Jackson Sharks, large Cobia (black Kingfish) schools of bait fish, Tailor and Bonito to large Bluefin Tuna. Looking closer along the rock you will often find Turtles sleeping under a ledge, huge schools of Bulls Eyes, which often completely block out your view, a Giant Queensland Grouper and 3 or 4 very friendly Blue Groper as well as up to 4 different types of Eels including the Mosaic and Conger Eel. Latitude Rock is one of our more popular sites, a relatively shallow dive, the maximum depth of 15 metres and average depth of 12 metres allows for extended bottom times. The mooring sits in 10 metres of water with several shallower ridges of reef at 5 m for a safety stop. The bottom topography of Latitude is a series of gutters and ridges running parallel with the Rock itself. There is kelp, sponges and colourful marine growth in the shallower parts, graduating to mostly bare granite rock in the 15-metre range. Small, mainly female, Grey Nurse Sharks aggregate here during the mating season. These sexually immature females travel inshore and away from the sexually aggressive and much larger males that inhabit the "Pinnacle" during October to December. 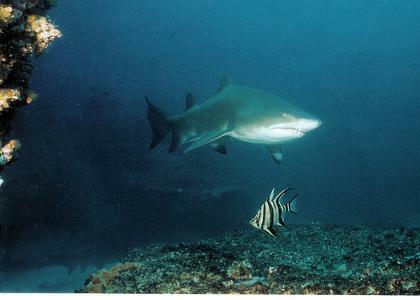 Grey Nurse Sharks are sighted here all year but in smaller numbers than the spring and early summer periods. Also commonly found all year are loggerhead turtles, Port Jackson Sharks, wobbegong sharks, elegant wrasse and black or estuary cod. All of these species are protected, some endangered and all at risk from some inappropriate fishing practices that occur at Latitude Rock. Latitude Rock is a perfect second dive after the much deeper "Pinnacle". 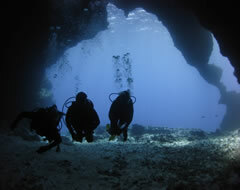 Jimmy’s Cave is one of the most fantastic underwater tours you can experience. Advanced divers only and everyone must have a torch. There is very good diving to be had here outside of the cave system, so those that are not qualified or would rather not experience the cave can still enjoy a sensational dive. The dive boat anchors on a rock ridge 10 m deep and you drop down through a vertical entrance into the cave system. The depth in the cave is 33 to 34 m. Spend a little time here exploring the cracks and crevices, huge "spider" lobsters are often seen. Take care in this section of the cave as big wobbegong sharks lurk here. Moving along you drop onto a sandy bottom and here you turn left into a dark tunnel rather than taking the first of the exits through which the light streams into the cave. This tunnel leads you into the "ballroom" filled with the ladder-finned pomfreds, bullseyes, and nannygai that shelter here. This is a great spot for photography with these fish silhouetted in the second and third exits from the cave system. Once you exit the cave ascend up an open chimney to around 14 m and a short swim from the anchor chain, which is draped across the ridge in 10 metres. If you have sufficient air, proceed from here along the wall, ducking under a swim through, to emerge in the "trench", a sandy bottomed, square cut gutter 29 m deep, looking up you may see Grey Nurse Sharks hovering above. Ascend to around 20 m for a short mid-water swim to a series of large boulders that lie in the “trench”. Duck under these boulders into two swim throughs, finally emerging under and to the right of a magnificent black coral tree, standing around 2 metres tall and festooned with brittle stars and wrapping worms. This is a great photographic subject, take care where you land here, as there are often wobbegong and Port Jackson sharks carpeting the bottom. The Interlinked Caves are located next to a 12 m deep rock ridge, located in the same area as Jimmy's Cave. The depth is 33 m. This however is a very different dive site. Impossible to find on your own it is a guided tour through a series of short caves and swim-throughs. As the name suggests, these caves lie adjacent to one another. As you exit one, another entrance presents itself to be explored. There are a number of blind caves in the complex, and caution needs to be exercised if there is any surge. Photographic opportunities present themselves at every corner. One cave has an exit that opens up into the back of an underwater grotto. 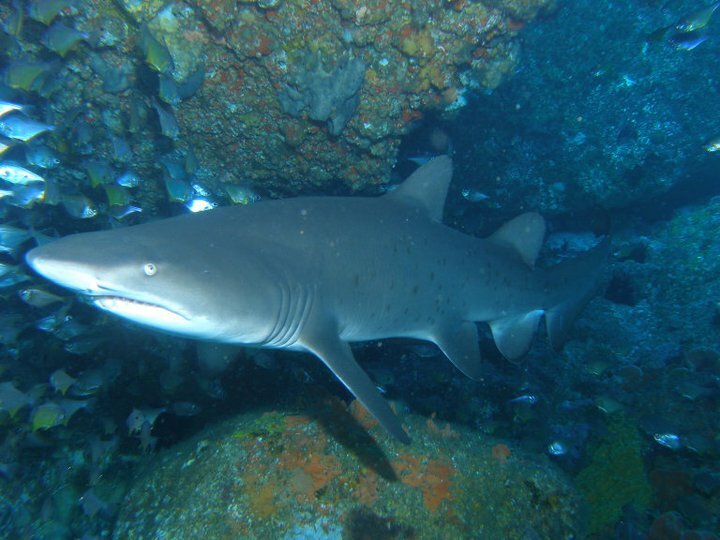 It is here that you often see grey nurse sharks, brilliantly backlit in the mouth of the grotto. Many divers comment that this is the best sea cave dive that they have ever done. Big Seal Rock is the larger of the two islands east of the Seal Rocks lighthouse. The Grotto. 12 to 23 m. Up to forty Grey Nurse Sharks jam the grotto and gutters. This is a great spot for underwater photography as the nurses are often positioned above the divers. A huge loggerhead turtle has his home here. The Wall. 4 to 45 m. This is a sheer wall that lies a little to the east of the Big Rock. There is a shelf of rock at 24 to27 metres that juts out from The Wall before it plummets to a boulder strewn sandy bottom. The Wall can only be dived in calm seas with no current, and when these conditions are available, this is a fantastic wall dive. Soft corals adorn the sheer wall; the coral garden bowl is an inset in the wall and the place to finish your dive allowing divers a beautiful area for ascent up past the soft corals. The Fish Bowl. 8 to 35 m. There is a series of rock shelfs that jut out from the island at 8, 15 and 20 m with the boulders on the sandy bottom at 35 metres. Grey Nurse and Port Jackson Sharks are often seen here, Bronze Whaler Sharks cruise the wall as do huge yellowtail kingfish. The Cavern (western gutter). This is shallow dive, 8 to 12 m. The Cavern in the western gutter is one of the most important areas in Australia for Grey Nurse Sharks breeding. 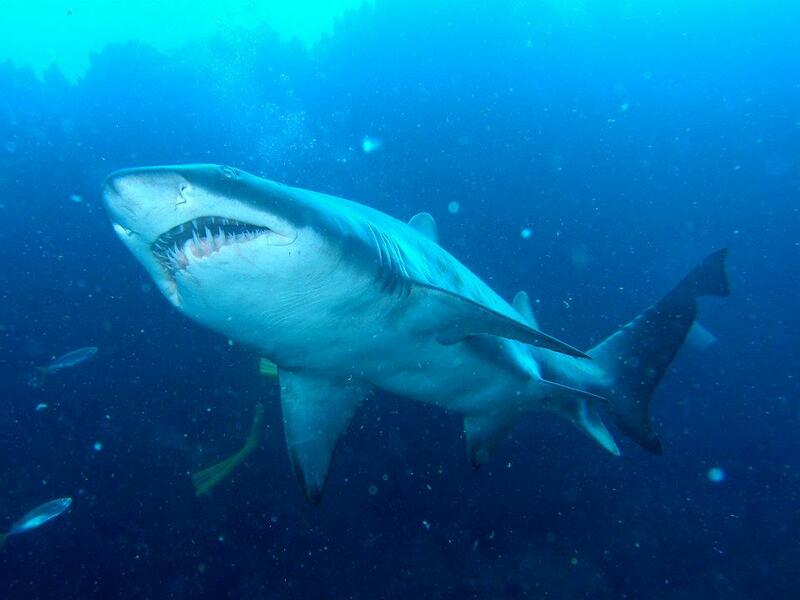 The gutter is 6 metres wide and this amazing dive site can be packed with up to 40 Grey Nurse Sharks at a time. 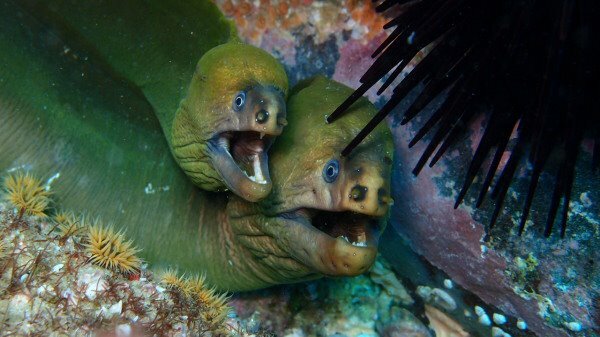 This is the perfect spot for underwater photography of the Grey Nurses, as they will come within touching distance of divers. This is a highly controlled dive site, no more than six divers at a time in the gutter, and all divers must be against the sides of the gutter so as not to disturb or frighten the sharks. The diving just outside the western gutter is also very good; schools of big yellowtail kingfish will swoop in and feed on the baitfish that congregate here. 1. Diving a Quadrant of the Island. The northwest side of the island is 12 to 20 m deep with huge boulders dominating the bottom. There are a lot of swim throughs under these boulders; a torch will reveal masses of fish sheltering there. These boulders are home to "Bicentennial" a massive resident black cod, about 1.8 m long. This is the area where in the past we have seen the greatest aggregations of Grey Nurse Sharks anywhere. The most nurses encountered here was estimated at over 200, before they fell prey to improper fishing practices. There were so many sharks they were literally four deep in the gutters. These days you will only encounter twenty to thirty sharks in the same area. 2. Guided Island Circumnavigation. Maximum depth is under 20 m, mostly in the 15 m or shallower. There is a gutter here that the small Grey Nurse Sharks inhabit, a sanctuary in which you see brand new pups. At a very steady rate of progress divers should be able to swim right around the island, carefully monitoring their depth, in around 30 minutes. The Little Rock, around the northwest quadrant, is a very prolific location for fish life. Yellowtail kingfish, snapper, bonito, tuna and jewfish (mulloway) are all seen here. 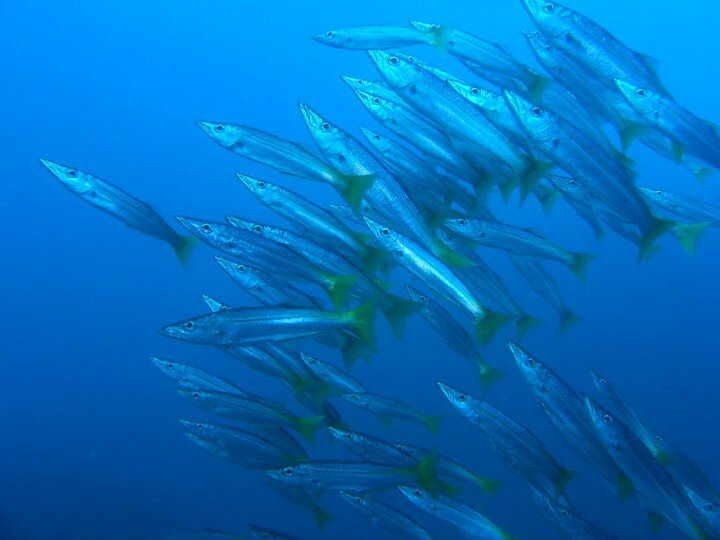 They arrive in schools to predate upon the clouds of bait fish, yellowtail and slimy mackerel that are found here. The Satara was built by W. Denny & Bros, Dumbarton, Scotland in December 1901. She was 410 foot long and was of steel construction with 2 decks, the upper deck sheathed with teak. She had 2 single ended boilers with an auxiliary boiler and was powered by a triple expansion 3-cylinder engine of 383 HP. She displaced 5200 tonnes. At around 11am on Wednesday the 20th of April 1910 she struck Edith Breaker just south of Seal Rocks and sank shortly after. There were 88 officers and crew and one passenger on board all of whom were rescued. The Satara now lies in 44 metres of water, lying on her port side with her bow pointing out to sea and her stern inshore resting on a reef. Descending down the anchor line, the first thing that strikes you is the size of the wreck spread out on the seafloor its huge. From the anchoring point, which is usually around the boilers, you have the option of either going forward to the bow or rear to the stern. The stern section by far is the best option, as you arrive at the huge boilers you will start swimming along the stern tube past large pieces of machinery and twisted metal, out on the sand you often see huge Black Rays and large Kingfish patrolling the wreck. The massive stern section where the accommodation was located will then greet you. This rises up over 12 m off the seafloor with a slight lean to the port side. 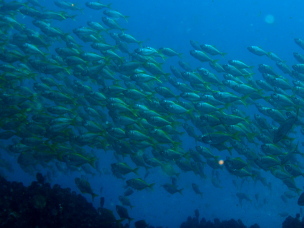 This area is a mass of fish life with large schools of Bull's eyes and morwong covering the wreck. Swimming under this section you will swim over the huge propeller measuring over 2 m each blade, over the rudder and under the stern section. This is where you will often encounter Grey Nurse Sharks and a large Black Cod. Heading back towards the boiler and anchor area, you will swim past more large pieces of machinery, large bollards and sheets of decking. Looking out on the port side on the sand you will see the small auxiliary boiler, which was blown clear when the ship sank. This is a brief description of a typical dive on the S.S Satara, it is so big that it takes several dives to see everything that it has to offer. Depth 35- 44 m advanced and deep diver training with logged recent deep dives. Photos: Ron Hunter. S.S. Satara left and Catterthun right. Built in England in 1881, the 92.5 m Catterthun was powered by steam but also rigged as a schooner. It was one of the first Australian ships to have electric lighting and refrigeration. The ship sank shortly after hitting the reef behind little seal rock on the 8th of August 1895 with the loss of 55 lives as well as some livestock including horses. The wreck now lies on a slightly sloping, sandy bottom in 55 - 60 m of water. The Catterthun was also carrying a large amount of gold coins, which less than a year after it sank was the scene of a record breaking salvage operation. Arthur Briggs and William May, under the supervision of Captain John Hall recovered 7 out of 10 boxes of gold from the specie room using cumbersome hard hat equipment and being supplied with air, hand pumped from the surface. This was an amazing feat for that time. It is still believed that gold still exists on the wreck, but a salvage operation in the 90s failed to recover anything. Descending onto the wreck it is surprisingly well preserved considering it has been underwater for more than 100 years. 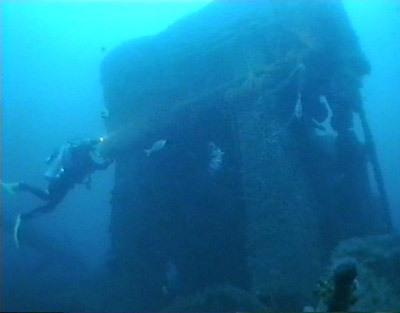 The steam engine stands proud in the middle of the wreck, standing more than 3 metres tall. The whole wreck is covered in beautiful corals and is home to a mass of fish. The bow section is twisted and tipped to one side, this is home to a large school of Jewfish and a large Black Cod. If you look closely in this area you can still find the odd leg bone from the Horses that were kept in this area. Swimming back towards the stern, you will make your way over open deck to the large rudder pentile, from here you can still make out the sleek shape of the hull of this once majestic vessel. Often while doing your compulsory decompression stops you will be joined by Common Dolphins and sometimes Bronze Whaler Sharks, an exciting way to finish a dive on an amazing piece of Australian maritime history. NOTE: The Catterthun is a deep wreck and is only available to dive by fully qualified and equipped divers with experience at diving to these depths. 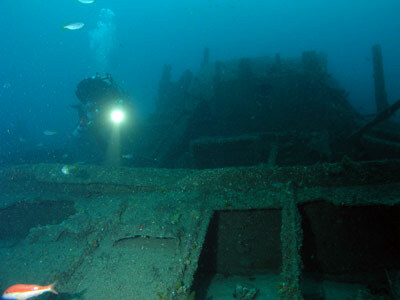 The site is also prone to strong currents and bad sea conditions, which make diving this wreck sometimes very difficult.